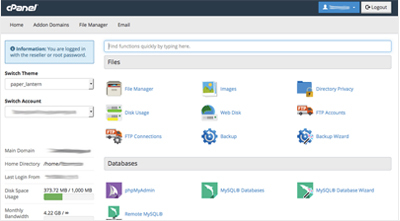 FlashWebHost.com was founded in 2001 and is one of the oldest and most stable web hosting companies in the world. The secret to our long history is the loyalty of our satisfied customers. FlashWebHost.com is a leading provider of high performance, low cost web hosting solutions. We offer a diverse range of flexible products coupled with unrivalled customer care. We only host on reliable servers with an up time in excess of 95%. All of our accounts include instant online set up and access to industry standard control panel. Whatever your requirements, FlashWebHost has a solution tailored to your needs. We specialise in script hosting like php mysql hosting, WordPress blog hosting, Joomla etc... We distinguish ourselves by offering superior customer service Guarantee. You'll find the FlashWebHost.com team is always friendly, understandable and helpful. For your peace of mind we host your site on Intel(R) Xeon(R) CPU E3-1270 @ 3.5GHz server with 8 GB Registered ECC RAM, 1 TB GB SATA II HDD drive disks and full UPS backup. Our network provider uses over 15 fully redundant high-speed lines into different backbone providers. All this adds up to the best possible combination of speed, safety and reliability for your web site. We provide Control Panel for both Domain name and Web Space. Domain Name - We provide control panel for domain name. Logging into domain control panel, you can change Owner, Billing, Technical Contact information, Domain Name servers, Create Child name Servers. 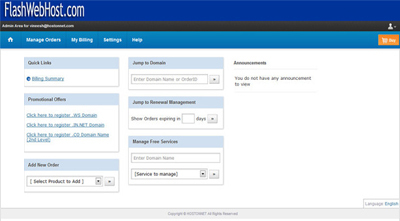 You can manage any number of Domain names through the Control Panel. Web Mail - You can read mails in your POP3 mail Box using the Web Based interface. You can check your mails anywhere in the world using Web Mail.